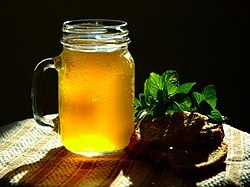 Kvass is a fermented beverage made from black or regular rye bread. The colour of the bread used helps to make the colour of the drink. It is a non-alcoholic drink by Russian standards. This is because the alcohol content from fermentation is less than 1.2%. Overall, the alcohol content is low (0.05% - 1.0%). It is often flavoured with fruits or herbs such as strawberries, raisins or mint. Kvass is also used for preparing a cold summertime soup called okroshka. It is popular in Russia, Belarus, Ukraine, Lithuania, Latvia, Poland, Estonia, and other Eastern and Central European countries, It is also popular in former Soviet states, such as Kazakhstan and Uzbekistan, where one can see many kvass vendors in the streets. Kvass is also popular in Harbin and Xinjiang, areas within China that are influenced by Russian culture. ↑ Ian Spencer Hornsey. A history of beer and brewing, page 8. Royal Society of Chemistry, 2003. "A similar, low alcohol drink (0.05% - 1.0%), kvass .. may be a "fossil beer"
↑ Katz, Sandor (2003). Wild Fermentation. White River Junction, VA: Chelsea Green Publishing Company. p. 121. ISBN 1-931498-23-7. This page was last changed on 19 November 2017, at 08:16.